People all over the world and in Chorley are celebrating 100 years since the Representation of the People Act 1918 and there is plenty happening in Chorley over the coming months to honour this milestone. Chorley Council is hosting a series of events over the next few months to commemorate 100 years of women having the vote and everyone is welcome to attend and join in with the celebrations. Councillor Bev Murray, who has been heavily involved with planning the events along with Councillor Fitzsimmons and Councillor Khan said: “2018 marks 100 years since the Representation of the People Act 1918 and this is a very important thing to remember and celebrate. “Many people fought for political representation and it is with thanks to them that so many people can have their say and vote today. “Here at Chorley Council, we always celebrate what is important so we are putting on a series of events for members of the public so that they can celebrate the milestone that has been achieved. “I would like to thank Lindsay Hoyle MP for helping secure the parliamentary workshop along with Chorley What’s your Story for the work to secure extra funding. The first event, on Monday 5 March, will take the shape of an introductory workshop provided by the parliamentary education service which will be from 6pm-8pm in Chorley Town Hall, Committee Room 1. The workshop will provide information on Parliament and the history of women’s suffrage as well as showing three short films. 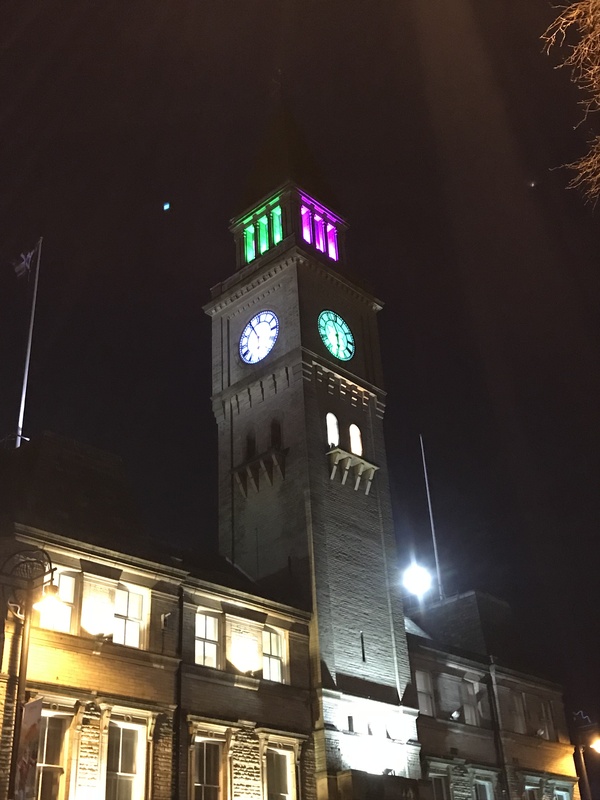 On International Women’s Day, Thursday 8 March, the colours of the Town Hall Clock will be changed to white, purple and green to reflect the colours adopted by the Women’s Social and Political Union led by Emmeline Pankhurst. Also for International Women’s Day, the Town Hall will be decorated with a banner to commemorate the anniversary and to remember the women involved in the fight to gain suffrage. The council are also looking to work in partnership with What’s your Story Chorley to secure a grant for work to raise awareness within schools and on Saturday 28 April a session will be held at What’s Your Story, Chorley? where women who contribute to the life of the community in Chorley will speak about their involvement in the town. For more information on these events and other events in the Chorley Borough, please visit chorley.gov.uk/whatson.